otherworldly enchantment of Spirited Away, Ghibli's most iconic work has been infused with the sort of strange, wonderful imagery that's best realized through animation. It shouldn't be forgotten, however, that there's long been more to Studio Ghibli than fantasy. Directed by Goro Miyazaki and co-written by his legendary father, From Up on Poppy Hill shies away from the surreal and supernatural. The film is set against the backdrop of the harbor city of Yokohama in 1963, a year before Tokyo would host the Summer Olympic Games. This is a time of transition for Japan, one in which the island nation seeks to honor its past while looking ahead to a bright, gleaming future. High school junior Umi can relate. Every morning without fail, she hoists naval flags in full view of the harbor to honor the memory of the father she lost in the Korean War. With her mother away studying medicine in the United States, Umi eagerly shoulders the responsibilities of running the family's boarding house while still carrying a full classload at school. Many others might buckle under all that strain, but Umi is propelled by such bright-eyed determination that she never misses a beat. Her classmate Shun feels a sense of responsibility too. You see, the Latin Quarter -- the aging building that houses their high school's clubs -- is about to be torn down to make way for new development. These student groups wouldn't be homeless or anything quite like that, but Shun doesn't want a new clubhouse when they have such deep-rooted affection for the one they're in now. It's not going to be easy to save the Latin Quarter from demolition, but with Shun, Umi, and a small army of their classmates banding together, maybe looking forward doesn't require paving over history. Something else from years gone by is creeping into the lives of these two high schoolers, though: a secret from the past that may threaten any future they have together. I adore From Up on Poppy Hill, an infectiously joyous film about the collision of past, present, and future...about passion, responsibility, determination, and family. There's not a glimmer of cynicism or misery to be found. The tragedies in their lives certainly influence the present but are housed in the past. What I mean is that nothing bad happens throughout From Up on Poppy Hill, at least outside of flashbacks. There isn't even a villain to overcome: no sneering student council president who couldn't care less about the clubhouse nor a moustache-twirlingly heartless real estate developer fixated on the bottom line. It's a sweet, heartfelt bearhug of a movie. Miyazaki has crafted a world that's wonderfully immersive, one that's easy to escape into despite a relatively simple premise and its disinterest in formulaic story beats. 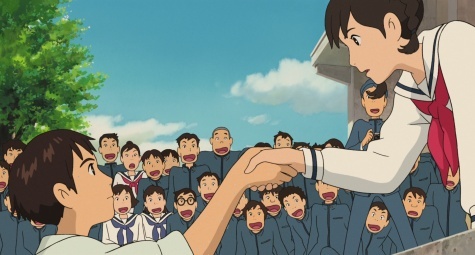 From Up on Poppy Hill doesn't need a badnik or bursts of tragedy when it has such a playful atmosphere, so much energy, and such richly drawn characters. 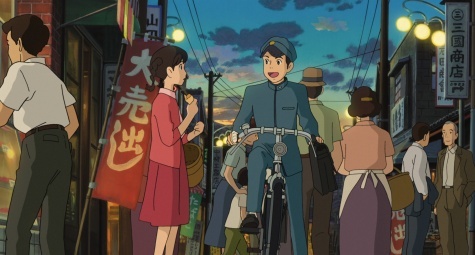 Though this is a story that could very easily have been told in live action, I can't imagine that From Up on Poppy Hill would have left anywhere near as much an impression without the benefit of Studio Ghibli's achingly gorgeous animation. love blossoming in a time of tumultuous change. Its charm and simplicity are assets, not a black mark, and From Up on Poppy Hill resonates emotionally without being the least bit cheap or cloying about it. Highly Recommended. From Up on Poppy Hill looks expectedly terrific in high definition. The line art is crisp, clean, and clear; the slightest bit softer than the likes of The Secret World of Arrietty, perhaps, but it's not enough of a difference to warrant any concern. I couldn't spot any missteps in the authoring: no banding, artifacting, or edge haloes. As From Up on Poppy Hill is a Studio Ghibli production, it goes without saying that the animation itself is stunning, and the film's painterly use of color and attention to detail are showcased wonderfully on Blu-ray. From Up on Poppy Hill arrives on a dual-layer Blu-ray disc at an aspect ratio of 1.85, and this presentation has been encoded with AVC. An anamorphic widescreen DVD is also offered as part of this combo pack. This Blu-ray disc features a pair of 16-bit DTS-HD Master Audio 5.0 tracks: one in the film's original Japanese and the other newly dubbed into English. Directed by Academy Award winning sound designer and Pixar alum Gary Rydstrom, there's a staggering amount of talent behind the dub, with Gillian Anderson, Aubrey Plaza, Christina Hendricks, Jamie Lee Curtis, Bruce Dern, Chris Noth, Beau Bridges, Sarah Bolger, and Ron Howard among those contributing their voices. Even with a roster like that and the craftsmanship that was clearly invested in this dub, it still doesn't sound anywhere near as natural or comfortable to my ears as the original Japanese audio. Of course, no matter which language you ultimately choose, From Up on Poppy Hill leaves precious little room for complaint. I found myself immediately in awe of the richness and clarity of the music. The lower frequencies are substantial and represented well despite the lack of a discrete LFE channel, most memorably an encounter with a mine in a devastating flashback. Though there's no need for a film this gentle and subdued to be backed by an overly aggressive mix, From Up on Poppy Hill still very much takes advantage of every channel at its fingertips. An emphasis on atmospherics ensures that there's a persistent sense of place, making it that much easier to wholly immerse myself in 1963 Yokohama and escape. The sound design is teeming with flourishes that make Yokohama seem that much more organic and alive. I especially love the toy piano and clumsy recorder in the background of the clubhouse. Fidelity is so strong that even a sound as mundane as a chair being pulled out from under a table thoroughly impresses. Shun's bicycle as well as the cars with which he shares the road are among the effects that smoothly make the trek from one end of the soundstage to the other. As anticipated, From Up on Poppy Hill's lossless audio teeters on the brink of perfection. Two sets of English subtitles are offered here. The first transcribes the English dub, and the other is a proper translation of the original Japanese soundtrack. worth, this alternate presentation is offered exclusively in English with no available subtitles. Hayao Miyazaki's Speech after the Staff Screening (6 min. ; HD): In the wake of the Great East Japan Earthquake, the elder Miyazaki speaks to the Studio Ghibli staff about the film and their perseverance. Miyazaki is strikingly candid about his reaction to the film, which he vocally regards as somewhat of a lesser Ghibli effort. He also briefly introduces several of the key contributors to the film, among them his son, director Goro Miyazaki. Press Conference - Theme Song Announcement (40 min. 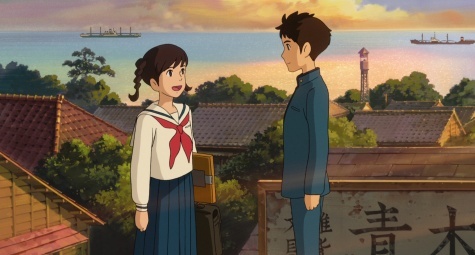 ; HD): The announcement of "Summer of Farewells" as the theme song for From Up on Poppy Hill is ostensibly the focal point of this press conference, although conversation often turns to the earthquake and tsunami that, in 2011, was still very much a fresh wound. Hayao Miyazaki speaks about his original pitch for the film and what compelled him to unearth a decades-old TV theme song for it. Most interestingly, the elder Miyazaki speaks about his disinterest in continuing to make fantasy films. The performers and original songwriters lend their thoughts as well, and a live performance of "Summer of Farewells" follows a lengthy round of Q&A. Music Video (6 min. ; HD): This high definition music video for "Summer of Farewells" is a natural complement for the lengthy press conference. Director Goro Miyazaki on Yokohama (18 min. ; HD): From Up on Poppy Hill's director speaks about shifting the original manga's setting to 1963 Yokohama, striking a balance between authenticity and properly cinematic visuals, the history and geography of Yokohama, and even a few notes about ideas that didn't make it into the finished film. This is a conversation that would benefit from some tightening in the editing room but is still well worth taking the time to watch. Yokohama - Stories of the Past and Present (23 min. ; HD): This visual documentary explores the history of Yokohama and the ways in which it's changed over the past few decades. Its examination of how the past and present intertwine couldn't be a more perfect match for From Up on Poppy Hill. English Voice Cast Featurette (22 min. ; HD): The producers of the English dub -- the legendary Gary Rydstrom among them -- offer a very detailed look into how a track like this is assembled. It's more insightful and thoughtful than other dub-centric extras I've come across in the past, and there's an enormous amount of footage of the voice actors at work and taking direction from Rydstrom. Writing for a dub, how the voice actors make these characters their own, greater interest in natural performances than simply matching lip movements, and the advantages of recording voices after the fact rather than during pre-production are among the topics addressed here. There's also a fascinating-slash-disturbing look at Jamie Lee Curtis mimicking a crying baby, so there's that too. Trailers (10 min. ; HD): Rounding out the extras are a two minute trailer in English, three Japanese trailers, and an onslaught of Japanese TV spots. From Up on Poppy Hill comes packaged with a handsomely illustrated booklet featuring conceptual art, excerpts from Hayao Miyazaki's original pitch, and a wonderful set of production notes by Goro Miyazaki. This combo pack offers both a Blu-ray disc and a DVD, and the set arrives inside a metallic cardboard slipcover. It's a natural tendency to try to figure out where a new Ghibli release ranks among the rest of the studio's impossibly brilliant body of work, but try to resist those urges and take From Up on Poppy Hill on its own merits. It's not an awe-inspiring fantasy. There's no spectacle or incendiary action to be found. There's not even the usual sort of dramatic heft. Still, this is a lovely, sweet, and very sincere film, one that's made stronger by its simplicity and straightforward nature. I'm hopelessly smitten with From Up on Poppy Hill, and I'm clearly not alone. This Blu-ray disc is a labor of love from GKids, longtime Ghibli supporters bringing one of the studio's films to home video for the first time. The presentation is spectacular all around, and the disc features several hours of extras as well as a Criterion-style booklet. This is such an underappreciated film that more than deserves to be discovered on Blu-ray. Highly Recommended.